The Oxford Companion to Sugar and Sweets explores the fascinating story of our desire for sweets—the impulse that prompts us to decorate elaborate wedding cakes, scoop ice cream into a cone, or drop sugar cubes into coffee. Through the collective knowledge of 265 expert contributors, from food historians to chemists, restaurateurs to cookbook writers, neuroscientists to pastry chefs, the Companion takes readers around the globe and throughout time, affording glimpses deep into the brain as well as stratospheric flights into the world of sugar-crafted fantasies. 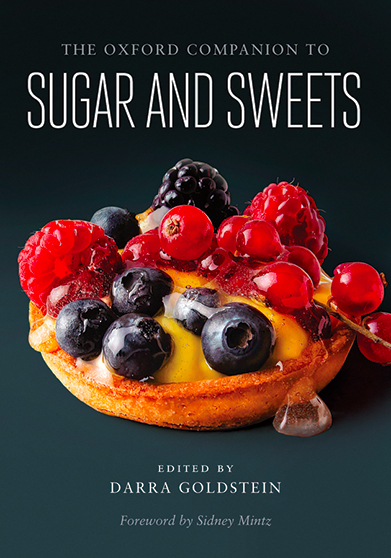 Celebrating sugar while acknowledging its complex and often dark history, this volume is the definitive guide to one of humankind’s greatest sources of pleasure.